Ion Beam Sputtering (IBS), also called Ion Beam Deposition (IBD), is a thin film deposition process that uses an ion source to deposit or sputter a target material (metal or dielectric) onto a substrate to create either a metallic or dielectric film. 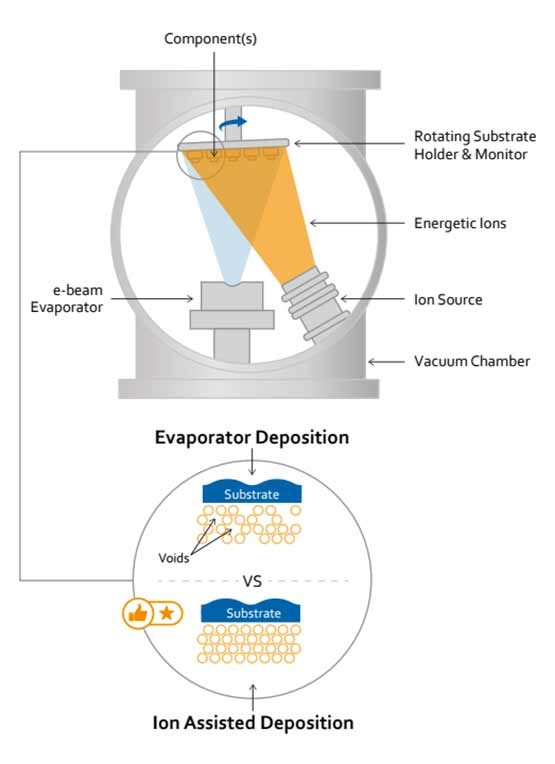 Because the ion beam is monoenergetic (ions possess the equal energy) and highly collimated, it enables extremely precise thickness control and deposition of very dense, high quality films as compared to other PVD (physical vapor deposition) technologies. The typical configuration of an IBD system is a gridded ion source, a target, and the substrate. The ion beam is focused on a target material, and the sputtered target material deposits onto a nearby substrate. It is common practice to utilize a second gridded ion source directed at the substrate to provide for ion assisted deposition (IAD). IAD is particularly useful when depositing metal oxide or nitride films to improve the film’s physical density, moisture stability, optical, and mechanical properties. In addition, it may be desirable to heat the substrates during deposition to improve overall performance. A key advantage of IBD is independent control of several parameters, including target sputtering rate and IAD parameters – ion energy, ion current density, and angle of incidence for control of film stoichiometry and microstructure. This level of control is the main difference between ion beam and other sputtering processes, making IBD a great choice for the most challenging applications such as precision optics or semiconductor production. 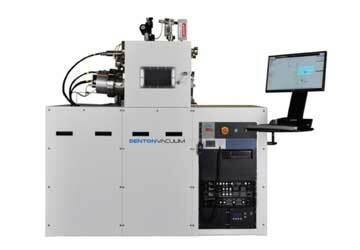 Denton Vacuum has developed solutions for ion beam sputtering that provide stable deposition rates for excellent film thickness and uniformity control. For details and specifications, take a look at our IBD solutions below. When you need a high-quality film for demanding applications such as optical interference coatings or x-ray mirror optics, the Infinity Ion Beam Deposition System is the solution for you.